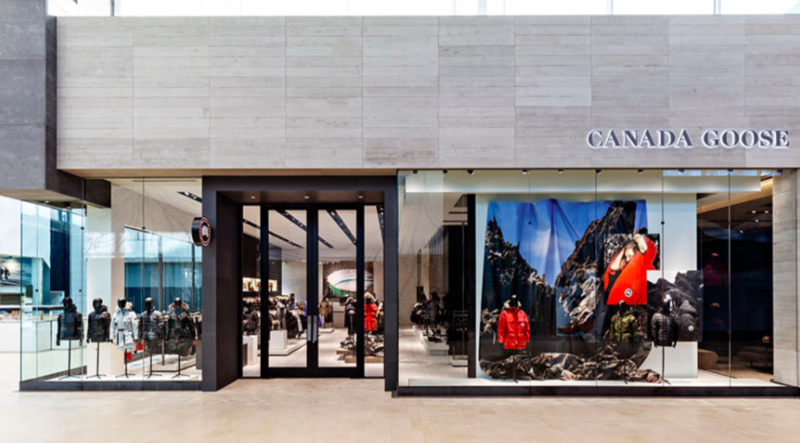 Canada Goose Inc. reported net income of Canadian $6.6 million, or 7 cents a share, in the fourth quarter ended March 31, rebounding from a loss of C$23.3 million, or 23 cents, a year ago. On an adjusted basis, earnings came to C$9.9 million, or 9 cents, against a loss of C$14.7 million, or 15 cents, in the same period a year ago. Wall Street’s consensus estimate had been a loss of 7 cents a share. EBITDA came in at C$198 million against a loss of C$26.7 million a year ago. Adjusted EBITDA was C$21.7 million, or 17.4 percent of sales, versus a loss of C$11.5 million, or negative 22.4 percent, a year ago. Revenues catapulted 144 percent to C$124.8 million from C$51.1 million a year ago. For the full year, sales grew 46.4 percent and adjusted net income per diluted share jumped 95.3 percent. “Our execution in fiscal 2018 was exceptional across all growth strategies and key metrics. These results reinforce my belief that we are still just scratching the surface of our global potential. As we continue to bring more Canada Goose to more of the world, we are resolutely focused on the long term and what we need to get there. Fiscal 2019 will be another exciting year, as we make significant strategic investments in infrastructure and people to support our foundation for enduring growth,” stated Dani Reiss, president & chief executive officer. Total revenue increased by 46.4 percent to C$591.2 million from C$403.8 million. On a constant currency basis total revenue increased by 47.7 percent. Wholesale revenue increased by 16.5 percent to C$336.2 million from C$288.5 million, driven by order book growth from existing accounts and higher re-order volumes late in the year. Direct-to-consumer (“DTC”) revenue increased by 121.3 percent to C$255.0 million from C$115.2 million, representing 43.1 percent of total revenue compared to 28.5 percent. The increase was driven by the strong performance of existing retail stores and e-commerce sites, including a full year of operations for Toronto and New York City retail stores, and incremental revenue from four new retail stores and eight national e-commerce sites opened during the fiscal year. Gross profit increased to C$347.6 million from C$212.1 million. As a percentage of total revenue, gross profit was 58.8 percent compared to 52.5 percent. The increase was primarily attributable to a greater proportion of DTC revenue, partially offset by higher inventory provisions. Wholesale gross profit was C$157.8 million, a gross margin of 46.9 percent, compared to C$125.1 million, a gross margin of 43.3 percent. The increase in gross margin was due to product mix, with a greater proportion of higher margin jackets from the Fall/Winter collection and lower material costs. DTC gross profit was C$189.8 million, a gross margin of 74.4 percent, compared to C$87.0 million, a gross margin of 75.5 percent. The decrease in gross margin was primarily driven by product mix, with a greater proportion of lower margin styles and products and, to a lesser degree, foreign exchange fluctuations. Selling, general and administrative (“SG&A”) expenses were C$200.1 million, compared to C$165.0 million, due to increases in retail store operating costs, corporate headcount, professional fees for public company compliance, marketing spend and administration costs. Fiscal 2017 included significant expenses related to initial public offering which did not recur, as well as higher share-based compensation expense relative to fiscal 2018. Operating income was C$138.1 million, an operating margin of 23.4 percent, compared to C$40.5 million, an operating margin of 10.0 percent. Wholesale operating income was C$120.6 million, an operating margin of 35.9 percent, compared to C$94.4 million, an operating margin of 32.7 percent. The increase in operating margin was due to channel gross margin expansion. DTC operating income was C$134.7 million, an operating margin of 52.8 percent, compared to C$59.5 million, an operating margin of 51.7 percent. The increase in operating margin was driven by a decrease in channel SG&A as a percentage of sales, which more than offset the decline in gross margin. Net income was C$96.1 million, or 86 cents per share, compared to net income of C$21.6 million, or 21 cents per share. Adjusted EBITDA increased by 84.1 percent to C$149.2 million from C$81.0 million. Adjusted EBITDA margin expanded by 517 basis points to 25.2 percent from 20.1 percent. Adjusted net income per diluted share increased by 95.3 percent to C84 cents on 111.5 million shares from C43 cents on 102.0 million shares.